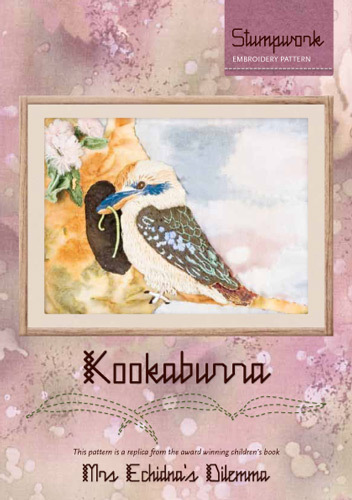 "Kookaburra Stumpwork Pattern" is a replica of one of the illustrations in the book. This particular embroidery is completed in 'stumpwork' or raised embroidery, using a variety of textured threads. Techniques used in creating this embroidery include thread painting style satin stitch, bullion stitch, wired elements (some leaves and the bird's wing and tail); tassels were adapted to create the gum flowers; detached buttonhole stitch on the gumnuts. Very detailed instructions and clear illustrations are included.